Let’s talk about the Sandy Hook School massacre. Far too many pundits and politicians have cynically used the tragedy to launch inflammatory rhetoric to push their pre-existing partisan agenda on gun control in the United States. In its ongoing coverage of the Sandy Hook tragedy the press interviewed politicians and other commentators on almost an hourly basis concerning the need for stronger gun laws in our country: as if stronger gun control laws would make any difference to a loathsome man determined to kill innocent people. It’s a complete illusion that additional gun control laws would prevent such massacres. Look at Great Britain, which has a similar cultural background to ours, and has always had extremely restrictive gun control laws, and where citizens do not have the right to bear arms as we do. A massacre occurred in Hungerford, Berkshire, England, in 1987. The gunman was armed with two semi-automatic rifles and a handgun. He shot and killed sixteen people including his mother, and wounded fifteen others, then fatally shot himself. A massacre at the Dunblane, Scotland, Primary School occurred in 1996. The gunman was armed with four handguns, and shot and killed sixteen children and one adult before committing suicide. A killing spree occurred in Cumbria, England, in 2010, when a lone gunman killed 12 people and injured 11 others before killing himself. As much as we may want to believe that the ready availability of guns in the United States is responsible for the actions of deranged individuals, the overriding fact is that even in Great Britain people who want to commit mayhem will find the guns to do the job. The problem arises when someone decides to pull the trigger of a gun with the intent to commit a crime. Tighter gun laws will definitely not change anyone’s mind when a person is bent on destruction. In a recent interview with NBC’s Jimmy Fallon, New York Mayor Michael Bloomberg spoke of the Sandy Hook shooting, and reminded us that 33 people are murdered in America with guns every single day of the year. His plan to remedy the problem is to require all gun purchasers to undergo a criminal background check, and to ban assault weapons and ammunition magazines that hold over 10 rounds. He’s joining a national movement, spewing anti-gun rhetoric intended to reinstate the ban on assault weapons and high capacity magazines which was rejected by Congress in 2004. What if we applied his logic to other areas of modern life? On average 93 people are killed in automobile accidents in the U.S. each day. This is three times more people than are killed by guns. So why doesn’t Mr. Bloomberg spend three times as much energy complaining about automobiles? According to an NBC News article, The Congressional Research Service in 2009 estimated there were 310 million firearms in the United States, not including weapons owned by the military. 114 million of these were handguns, 110 million were rifles (including high capacity assault-type rifles), and 86 million were shotguns. In that same year, the Census bureau stated the population of people in America at 305,529,237. These 310 million firearms come in all sizes and shapes. No one can say how many of these firearms are assault rifles or have ammunition magazines that hold more than ten rounds. These firearms are not likely to disappear, whatever their configuration and whatever the law says. Actually, New York state laws have always made it a felony to possess ammunition magazines that hold more than ten rounds, unless the magazine was manufactured prior to 1994. There is obviously no evidence that magazines built before 1994 are less dangerous to the public than those built after 1994, yet this date made the difference between an honest citizen and a felon. A bill recently passed by the state legislature maintained the ten-round clip size limit, and reduced the number of bullets allowed in a clip to seven rounds. These recent changes emphasize the pure mendacity and deception of the whole legal scheme. If I have in my possession in New York State a newly made ordinary fourteen-round magazine for a pistol, even though I have no pistol and there is no ammunition in the magazine, then my status changes from honest citizen to a criminal subject to a prison sentence. It’s not just four rounds of ammunition; it’s an empty space where four rounds of ammunition could potentially be stored. This law is an abomination; a status crime with no relation to public safety; it should be declared unconstitutional; and now the anti-gun lobby wants to impose this law on all citizens of the United States. Such a ban on assault rifles and high capacity magazines is simply another way of saying that the government doesn’t trust the millions of law-abiding gun owners. Give them a pistol that holds 14 rounds of ammunition, or an assault rifle that holds 30 rounds, and all these citizens will sooner or later abandon morality and begin to conceive of plans to shoot ten or twenty people at a time. Armageddon is just around the corner if we don’t act now. If we can restrict citizens to ten round magazines, the urge to kill won’t come over them and we’ll all be safe. It’s an exercise in blatant political cynicism for Mark Kelly and Gabby Giffords to use Gabby’s injured body and Mother Teresa reputation to make her the poster child for why we need to ban assault rifles and high capacity magazines. Her situation was a single tragic event. Because of her single tragic event, and a few other single tragic events, they are saying, we should not trust any of the American people to handle their weapons responsibly. I take her appalling assessment of the sanity of the American people as a personal affront to me. What she, and other advocates of tighter gun control based on a few tragic scenarios, are saying is utter sophistry. It’s like saying that because there have been a few airplane crashes that killed more than 200 people each, we should stop trusting our pilots to handle high-capacity aircraft. The government should limit the carrying capacity of passenger aircraft to 10 passengers. Then when those untrustworthy pilots muck things up again, not so many people will be killed. There is no statistical significance whatsoever in the demonstrated “44.5% decrease” in assault pistol recoveries, based on the minuscule overall numbers. It is beyond absurd that the authors would even pretend to believe that these numbers provide evidence that the assault pistol ban is working. The study does provide some evidence that criminals are following the law (how totally fabulous is that!) What’s even more absurd is that such studies are actually accepted by legislators and members of congress as evidence to support a ban on assault weapons and on high capacity magazines. The fear of “assault weapons” and “high capacity magazines” is a delusion, and law-abiding citizens should not be made into criminals on the basis of mythical anxieties. A lengthy study entitled “Firearms and Violence,” was sponsored by the National Institute of Justice, Centers for Disease Control and Prevention, the Joyce Foundation, the Annie E. Casey Foundation, and the David and Lucile Packard Foundation. These are not gun nuts or firearms apologists. They were searching for evidence, wherever the evidence might lead. This study was made available to Congress in 2004, and may have played a part in the non-renewal at that time of the assault weapon and high capacity magazine ban. The findings were that current research and data on firearms and violent crime are too weak to support strong conclusions about the effects of various measures to prevent and control gun violence. Data limitations are immense in the study of firearms and violence, the study emphasized. There has been no improvement since 2004 in the “data limitations” and “lack of reliable data” described by the government’s own researchers. I defy anyone to demonstrate in a statistically significant manner that there is any overall reduction in the rate of gun violence which can be attributed to the banning of assault weapons or high capacity magazines. 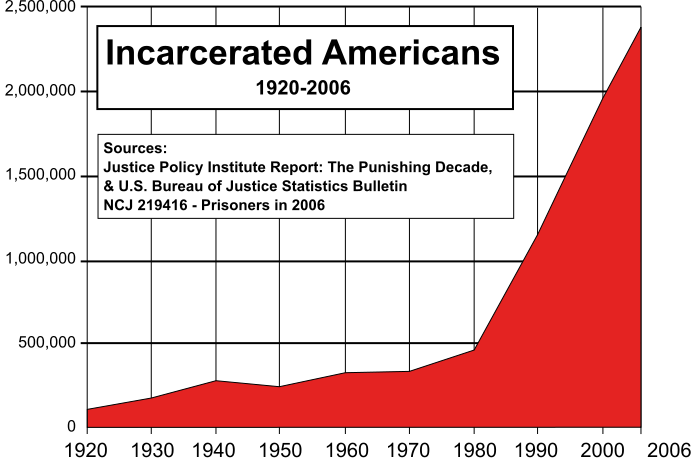 The below US Department of Justice, Bureau of Justice Statistics chart shows several things. One, homicide rates by “assault weapons” in the US have always been minimal. 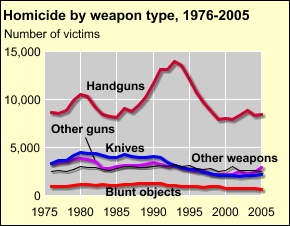 Assault weapons are normally not handguns, and thus are lumped for statistical purposes with other long guns, thus falling in the chart category labeled “other guns” shown with the purple line. The purple line has remained low and relatively stable since 1975, with no statistically significant or even minimally meaningful variation during the time assault weapons were banned between 1994 and 2004. The more likely assumption from the first chart is that hugely successful law enforcement efforts in arresting and incarcerating violent criminals, as shown in the second chart below, were responsible for the drop in handgun homicides. Another concern a reader might have is that the first chart ends in 2005, just after the assault weapon and high capacity magazine bans ended. Did the numbers rise after the bans were ended? According to the UN Office on Drugs and Crime, homicides by firearm in the US actually decreased further after 2005. In 2006 there were 11,360 homicides by all kinds of firearms in the US. In 2007, 11,630; in 2008, 11,030; in 2009, 10,300; in 2010, 9960. Once again, we find that evidentiary support for the past and proposed bans on assault weapons and high capacity magazines is totally lacking from the statistics. Only histrionics can be wielded in support of these mythical cures. It’s a national disgrace for us to callously incite people into unthinking action, by reciting single tragic instances such as the massacres at Sandy Hook and Aurora as a proof of concept. Once again, we can undoubtedly thank our law enforcement community for their herculean efforts to reduce the overall levels of violent crime nationwide. Tougher background checks on gun purchasers may have also made a difference, although there’s once again no empirical data which shows that more stringent background checks will keep guns out of the hands of violent criminals. It mostly means that violent criminals will have to pay more for their guns in the black market.